The Considerate Constructors Scheme has proudly partnered with the Construction Industry Helpline – a confidential hotline dedicated to supporting and assisting the industry’s workforce. 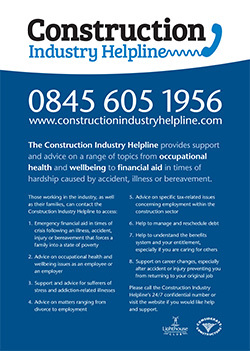 Working with construction industry charity the Lighthouse Club, the helpline was unveiled at the Scheme’s annual Drinks Reception, held in the Imperial War Museum on Thursday 4th December. Managed by the Lighthouse Club, the 24/7 confidential helpline is not publicly funded and relies entirely on the generosity and support of industry organisations, fundraising groups and individuals. It has already received fantastic support from industry donators Mulalley, Canary Wharf Contractors, Elev8 Interiors, Parkeray and Rydon – whose generosity has helped get the helpline off to a flying start. Organisations can play their part in raising awareness of the helpline, as well as much-needed funds, by purchasing branded wristbands and posters for their workforce. Wristbands include the helpline logo, as well as the website address and telephone number, and every wristband also comes with a free wallet-sized helpline card. Wristbands cost £2.50 (+ VAT) each. Wristbands are made from silicone. The A2 poster is to be displayed internally, in a canteen, site office or similar, so that those working on site or in an office can read about the helpline and get in touch if they would like to. The A2 poster details the different ways the helpline can provide assistance to help those in times of crisis. Posters cost £7.50 (+ VAT) each. All profits from the sale of the above items will be donated to the Construction Industry Helpline to fund its ongoing support to the workforce. The helpline will share usage data only with the Scheme so that it can understand where areas of construction need to be improved so that new initiatives can be developed in order to address issues raised. The helpline is strictly confidential and no personal or private details will be shared. I am absolutely delighted to be able to launch the Construction Industry Helpline in partnership with the Considerate Constructors Scheme. I am extremely grateful to the Scheme for its help in raising awareness of this much-needed facility for workers in the construction industry and their families. This unique helpline will give helpful advice to those facing difficult times as a result of unforeseen circumstances such as illness, accident or bereavement. I am heartened by the amount of support already pledged by construction companies and would like to thank the Scheme for their help in producing these fabulous and useful wristbands and posters which will hopefully reach the whole workforce. I like to think of the construction industry as one big family with a duty of care and responsibility to its workers – as considerate constructors. I hope the industry and its workforce will benefit greatly from this worthwhile initiative. The Considerate Constructors Scheme is extremely proud to help launch this fantastic and invaluable service, dedicated to the industry’s entire workforce and their families. Our workforce are renowned for their resilience, hard-work and courage, completing projects in all weathers, conditions and often extreme circumstances. However, there are also risks associated with working in construction, and unforeseen events can sometimes impact on workers’ health, livelihoods and family life. This is where the helpline can help – by offering advice and support for workers and their families and helping them back onto their feet. Our heartfelt thanks go to the Lighthouse Club for inviting the Scheme to help with this vital initiative and to our industry partners who have already pledged their support to such a worthwhile cause.